This is my second go-round with beer can chicken. 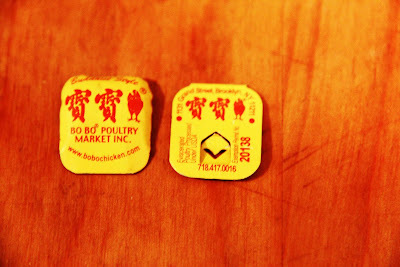 I got the young chicken at Hong Kong Supermarket in New York's Chinatown, who in turn got it from Bo Bo Poultry Market on Grand Street in Brooklyn. They sell it whole at refrigerated temperatures, with feet, heads and organs. I've been following the rub credo: "Never measure, always air on the side of too much." Make sure to rub it across all available surface area, as well as inside the actual chicken. Next I poured beer inside my new Sittin' Chicken roasting stand, and added some of the rub and a few garlic cloves. The general idea here is to sit the chicken on the stand and let the moisture evaporate into the meat as it cooks. I tucked the chicken's arms behind it's back, then put placed it on the egg at 350, until there was a nice crispness to the outside and the meat was cooked through. It's hard to describe the difference in taste, but it's unlike any other chicken I've had.